I want to talk a little bit about my idea of “reincarnation,” since I really don’t have anything else to talk about today. I’m going to preface this by saying that my concept of reincarnation is based on Stephen King’s Dark Tower series. Well, no, not really based on. But perhaps, influenced by? Introduced by? I don’t know. He writes about something that could be considered reincarnation that kind of makes sense to me with slight modifications. 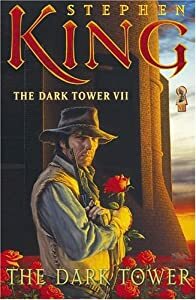 The idea he presents – or seems to present – comes from the very end of the tale (serious spoiler alert, because trust me, you never see it coming), when the main character, Roland, climbs to the top of the Dark Tower, a legendary monolithic universe-lynch-pin. Throughout the tale, Roland wonders from time to time what he will find when he reaches the top. What he finds is a door – that opens up and pulls him into his own past, his own life… where he has made different choices that may lead to a different outcome. Because I believe that life is a test, a modification of this idea makes sense to me: We are sent back, over and over again, in the same life/person, until we “pass” the test and finally learn all of the lessons life has for us. Then, presumably, we continue on to otherworldly existence, or perhaps cease to exist entirely. Now, those italics? That’s probably where my belief in reincarnation differs from yours, if you have one. In my experience, most reincarnation-believing pagans think we come back in multiple different lives or incarnations – for example, that they may be a current incarnation of Julius Ceasar, or Ptolemy, or DaVinci. (You get the idea.) That’s fine and all… I just don’t feel I’ve ever been anything other than what I am. It doesn’t make sense that I could have been. Of course, that’s just me. That’s fine too. Yeah, I figured I wasn’t gonna get much space outta this one. I seem to think I’m going to write more than I have to say on stuff like this, heh.